This cosy, New England-style hotel is conveniently located only a two-minute drive from the Manchester-Boston Regional Airport, making it ideal for business travel and stopover flights. The city centre of Manchester, New Hampshire, can be reached in less than 15-minutes by car, and Boston is about an hour's drive away. The hotel's cosy studios and one- and two-bedroom suites are spacious and stylishly decorated in soothing winter tones. The separate living, dining and sleeping areas provide plenty of space for business travellers to work and for families to relax. Guests can take advantage of the in-room fully-equipped kitchen with refrigerator, microwave, dishwasher, and two-burner stove to prepare home-cooked meals, or enjoy a complimentary breakfast and dinner in the dining area. Business travellers might also make use of the business centre with onsite meeting rooms, all for a pleasant stay in Manchester. This hotel is the perfect place to explore winter Vermont. Manchester Designer Outlets is a short drive from the motel and Equinox Valley Snow Tours is 8 km away. Bromley Ski Area is also 8 km from the establishment. Rooms come equipped with cable TV and feature wood furnishings and carpeted floors. An en-suite bathroom is also included. A full continental breakfast is served each morning but there are other dining options in the vicinity. Guests can enjoy the indoor 9-hole miniature golf course or spend some time at the video arcade games. The hotel has a seasonal outdoor swimming pool and offers picnic tables for guests who wish to explore the surroundings. 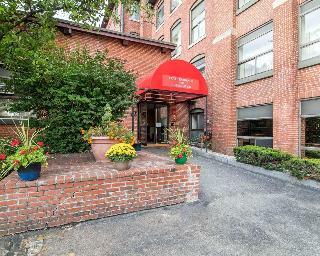 This modern hotel in Manchester, New Hampshire offers a wide array of facilities and services for added convenience. Guests can take advantage of the free airport transfer service to Manchester-Boston Regional Airport, free internet access and local calls, and free hot breakfast with eggs, waffles, yogurt and fresh fruit. Additionally, business travellers can make use of the banquet hall and meeting rooms capable of hosting up to 140 guests for business and social functions. 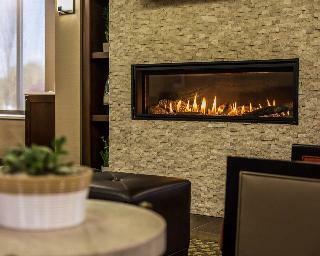 This pet-friendly hotel's spacious rooms are fully-equipped with refrigerator, hairdryer and cable television, and non-smoking rooms, laundry facilities and a well-lit parking area are also available. Guests may go for a swim in the heated indoor pool, or venture out to the shops, restaurants and bars of the surrounding area, or nearby White Mountains, New Hampshire Motor Speedway or Verizon Wireless Arena.